Sales are closing in on pre-recession rates exceeding 16 million, far above the 2009 trough of 10.4 million. DETROIT — Chrysler, Ford, General Motors, Nissan and Toyota all posted October sales increases as the U.S. auto industry rebounded from a lackluster September. “After a choppy start to the beginning of the month, Chrysler Group sales accelerated in the second half of the month with renewed consumer confidence,” Reid Bigland, the company’s U.S. sales chief, said in a statement. 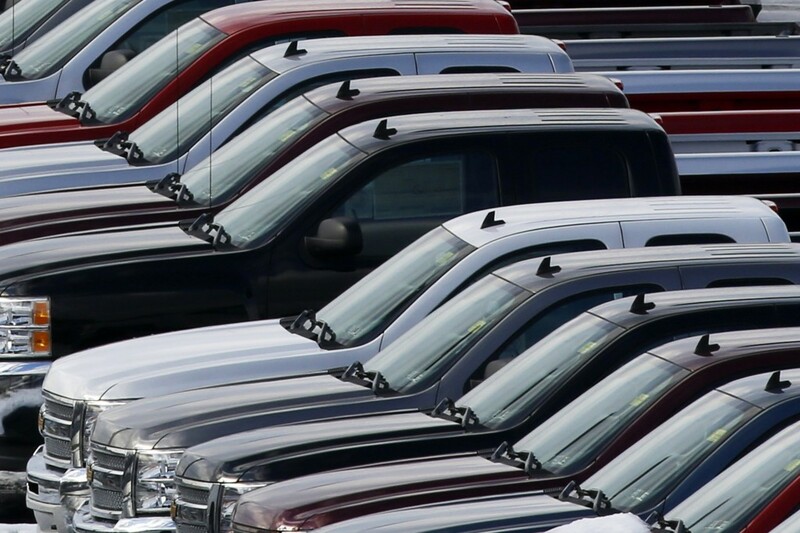 All automakers report October sales on Friday. Ford Motor Co.’s U.S. sales jumped 14 percent last month on strong demand for the F-Series pickup and the Fusion sedan. F-Series sales were up 13 percent to 63,803, its sixth-straight month of sales above 60,000. That hasn’t happened since 2006. Sales of the Fusion midsize car jumped 71 percent over last October, when the old model was being phased out. But sales of Ford’s small cars, the Focus and C-Max hybrid, fell around 20 percent. Ford recently announced plans to idle the Michigan plant where both vehicles are made to cut down on excess inventory. At General Motors Co., sales rose 16 percent as its full-size pickup trucks rebounded from a poor showing in September. The Chevy Silverado, GM’s top-selling vehicle, posted a 10 percent increase to nearly 43,000, while the GMC Sierra pickup saw sales rise 13 percent to just over 16,500. The Chevy Impala large car posted a 40 percent increase, and Malibu midsize car sales rose nearly 64 percent. But the Chevy Cruze compact, one of GM’s biggest sellers, posted a 16 percent decline. Chrysler Group LLC said it sold 140,083 cars and trucks last month, up from 126,185 in October of 2012. It was the company’s best October in six years, and its 43rd straight month of year-over-year sales gains. Chrysler was led by its two most profitable vehicles, the Jeep Grand Cherokee SUV and the Ram pickup. Grand Cherokee sales were up 20 percent, while Ram pickup sales rose 18 percent. But sales of the tiny Fiat 500 dropped 36 percent as Chrysler offered a larger version and gas prices fell during the month. The company sold 579 new Jeep Cherokees in October. Sales of the small crossover SUV had been delayed as Chrysler smoothed out its rough-shifting transmission. Chrysler began shipping Cherokees on Oct. 22. Nissan Motor Co. sales rose 14.2 percent to more than 91,000, an October record for the company. Nissan Division sales were up just over 15 percent, while the company’s Infiniti luxury brand posted a 4.5 percent increase from a year ago. Toyota sales rose nearly 9 percent last month to nearly 167,000 vehicles despite headwinds from the government shutdown, the company said. Of the automakers reporting so far, only Volkswagen posted a decline at 18 percent. VW is up against strong growth from last year, but many of its models have faltered in 2013. Industry analysts predict an 8-to-13 percent sales gain for October, with sales running at an annual rate of about 15.4 million for the month. But Chrysler said its calculations show a 15.7 million annual rate, one that would make October the fourth-best month of the year. The increase follows a 4 percent drop in September because Labor Day weekend was counted in August figures this year. Analysts say the 16-day government shutdown in early October kept buyers out of showrooms early in the month, but that apparently was just a temporary slowdown.